The school sporting year has got off to a great start. An inaugural Sports Awards Evening took place within the first week of term to celebrate the achievements and contribution of many girls across the Senior School – from elite performers to all round commitment to sport and the most team spirit. There were speeches from the PE team on all aspects of sport in the school including: athletics, netball, cross-country, dance, trampolining, fencing and rugby. The guest of honour was GDST alumna and Women’s Rugby World Cup champion Sophie Hemming. Sophie presented the awards and spoke to the girls about her road to success, its highs and lows, and winning her gold medal in 2014. Her underlying message, though, was to never give up and that it’s never too late to go for what you want. 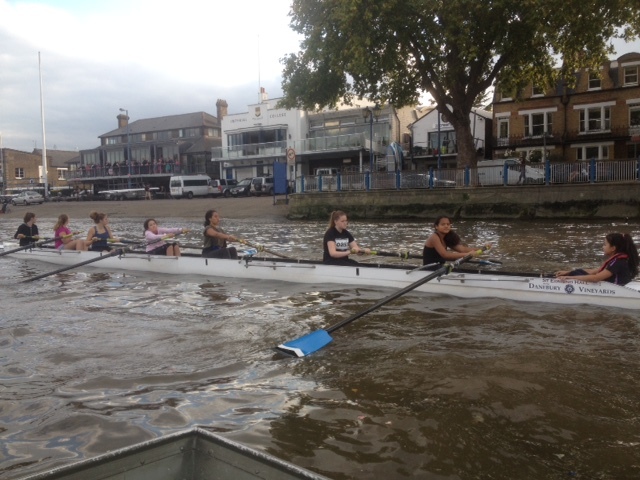 Within a few weeks there was another first – the first outing of the new Sydenham High rowing team on the Thames. The opportunity has come as a result of an arrangement with the Dulwich College boat club and the team will be out each weekend looking to build their skills under the supervision of one of the DC rowing coaches. The netball season has also started well. Year 6’s B team beat St Christopher’s School 7:2 at home on 9 October, while Year 8 have had three wins, one draw and just one loss across both A and B teams. The Year 9 netball team’s high level commitment and hard training is yet to deliver a win but they have drawn two out of three matches played so far. Frances Newe (Year 8) was selected to represent London at the English Schools Swimming Competition in Leeds on 3 & 4 October where she achieved 6th place in the 400m freestyle. Frances is now ranked No1 in London for several events and 18th in the country for the 200m butterfly. Only the best swimmers were invited to the event, which is the highlight of the school swimming calendar. The International Schools team will be selected from those taking part. Amy Miller (Year 8) won a bronze medal with her cross country team (Herne Hill Harriers) in the U13 National Road Relays. Ellie Osmond (Year 8) came 16th in the Cross Country Cup London round in a field of more than 60 competitors. Edith Alderton (Year 9) has won three gold medals and one bronze at a gymnastics competition in Essex, finishing in overall first position. Ally Housley (Year 11) has been selected to play for Surrey Storm Under 19s netball team – the Manchester United of the netball world. Dance Show auditions are underway in preparation for this year’s Unity Through Diversity Dance Show in December.